You're on vacation. It's perfectly ok to completely lose track of time. Skybridge makes the crossing the street that much easier. Grotto pool, three jacuzzis and more keep your crew entertained. You're right on the white-sand beach! Seasonal children's events include a weekly Dive-In Movie, pool games, face painting, and arts & crafts. Relax as you float down the lazy river. 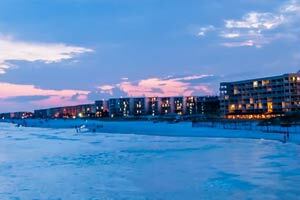 The beachfront Destin West Vacations is a six-part condo complex that spans Okaloosa Island, touching the powder-white beaches on the Gulf of Mexico on one side, and the calm water of Choctawhatchee Bay on the other. With seven outdoor pools, three hot tubs, and a lazy river, there’s no shortage of underwater excitement at Destin West. Grab a cocktail from the swim-up bar and watch the little ones have a blast at the kid’s splash pad. Daily seasonal activities cater to all ages, so be sure to take a peek at the schedule. The on-site Sky Bridge allows you to cross the highway to the beach safely. Rent a kayak or paddle board, and explore the calm waters of the bay. If you’re still going strong, stop by the well-equipped fitness center and get in a workout. Studio condos sleep four guests and have kitchenettes with a microwave, full-size refrigerator and stove. Three-bedroom condos sleep eight guests. Full kitchens give you the freedom to make and serve meals in your condo. Publix supermarket is just over a mile away. Bring the family along to help carry grocery bags. When you return to your condo, bake up a batch of chocolate chip cookies and let the kids pitch in. Don’t worry if the eggs and chocolate decide to go rogue; you’ll have an in-suite washer/dryer. Show off your multitasking skills by putting the kids down for their nap, doing a load of laundry and watching the latest episode of Ellen on the Cable TV. You’re walking distance to several waterfront restaurants including the Black Pearl, The Crab Trap, and Fudpucker’s Steam Shack, as well as local shops. Guests of Destin West receive access to the Grotto Pool with swim-up bar, Heated Cabana Pool and kid’s water play area at the adjacent Ramada Inn. If you’re up for even more water, there’s Big Kahuna’s Water and Adventure Park. It features over forty attractions including water play areas, pools, and slides. Attention, shoppers! Destin Commons Mall has everything you need for a fun day go shopping. First stop: Starbucks for a frappuccino or latte. Surprise the kids with a visit to Build-a-Bear, the tweens with a visit to Claire’s and yourself with a visit to Pandora. When it’s time for lunch, there’s Red Brick Pizza, Smashburger and Johnny Rockets. Catch a movie at the AMC Movie Theater.